Artifacts are items that can be donated to the Museum or sold for a small profit. Donating to the Museum will yield rewards when donation milestones are reached, or when specific artifacts are donated. Each artifact may only be donated once. Artifacts have little use other than donating them to the museum. The Dwarf Scrolls, Dwarvish Helm, and Dwarf Gadget may be gifted to the Dwarf as liked gifts, the Ancient Seed may be crafted into a plantable Ancient Seeds pack, and the Dinosaur Egg may be used to hatch a Dinosaur or turned into Mayonnaise. Using the Hoe on an Artifact Spot. Different parts of the map will produce different artifacts. Artifact Spots are much more common in winter. Using the Hoe on dirt in The Mines and the Skull Cavern. Donating an Ancient Seed returns an Ancient Seed crafting recipe and 1 Ancient Seed pack, which can then be planted to harvest Ancient Fruit. Donating all four Dwarf Scrolls unlocks the Dwarvish Translation Guide, allowing the ability to speak to the Dwarf merchant in the Mines. Donating the Ancient Drum rewards the player with a Drum Block. Donating the Bone Flute rewards the player with a Flute Block. Donating the Chicken Statue rewards the player with a Chicken Statue furniture item. Donating the prehistoric bone pieces rewards the player with the Sloth Skeleton furniture pieces. Donating the Rare Disc rewards the player with the 'Burnt Offering' painting. Note that the Quarry is considered part of The Mountain when digging up Artifact Spots. For Fishing Treasure Chests, the artifact has a higher chance of appearing if all 20 Lost Books have been given to the Museum. Entries are added upon finding the artifact. The artifact does not need to be donated to the Museum or shipped via the shipping box to count towards the collection. 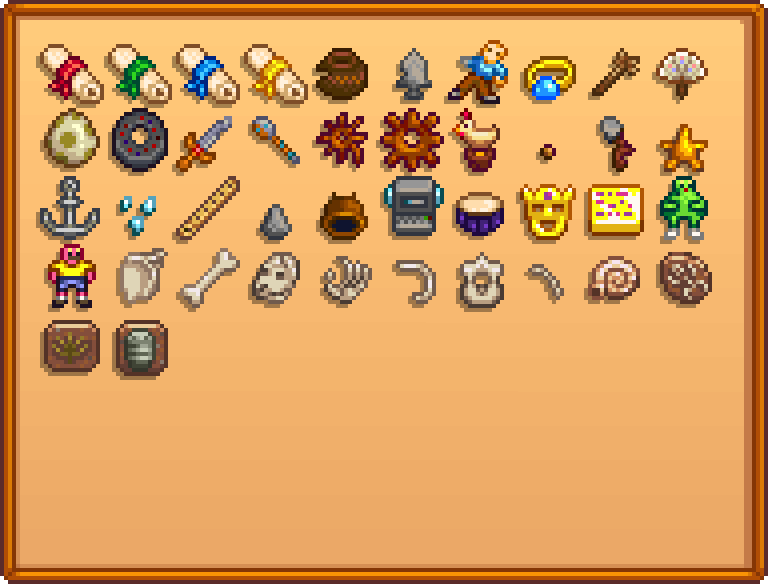 Note that artifacts found in Fishing Treasure Chests or obtained by tilling soil in the mines may not appear as found on the collections tab. Dragging the artifact outside the inventory window and allowing it to be taken back into inventory may correct this. Holding the artifact in inventory overnight may also correct this. Note also that artifacts' descriptions appear on the collections tab as soon as they are found, even while the inventory description says "Gunther can tell you more about this if you donate it to the museum."